RIP DJ Rashad. Here are the thoughts and memories about Rashad, written by Ventah and b3no. I was lucky to meet Rashad (along with DJ Spinn) in Bristol, in August 2013. They were playing at a club called Timbuk2 on one of their UK tours, and they played a monster of a set. 1.5 hours long. 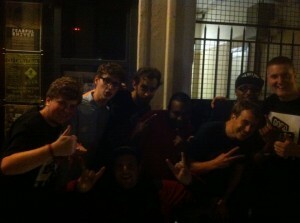 After the gig, myself, along with Phrixus, Crypticz, Tenz, Skimatix and Moggz, had a good chat with them both. I told them about the UK scene and the massive influence, respect and popularity they had in the UK. That is even more true today than it was then. Rashad was a true innovator and forward thinker. His music was brilliant, and his music was helping to bring the Juke/Footwork scene to a wider audience. I have a massive amount of respect and admiration for the Teklife crew, and I know they’ll continue working hard. Rashads’ music was a great inspiration for me, it’s unbelievable to think he has gone. My thoughts & condolences to all his family, friends, teklife crew in Chicago and beyond.